Another interesting bottling from the excellent rum importers, Oliver and Oliver. This bottling forms part of their line of premium rums, which are named after José Julián Martí y Pérez. José Martí is a national hero of Cuba, who was a poet and essayist, best known for championing the cause of Cuban independence in the late 19th Century. Indeed, he was known as the “Apostle of Cuban Independence”. Whilst this rum is in fact from the Dominican Republic (Oliver and Oliver had to leave Cuba after the Revolution) this is still a fitting tribute to Martí, who travelled to this nation, and who emphasised the intellectual independence of the Hispanic people of the Americas. This rum has been aged in a solera system, meaning that when a cask is tapped for bottling, it is topped up with spirit from the next oldest cask, to ensure a consistency of flavour. The cask is never entirely emptied. The 23 years on the label of this rum refers to the youngest spirit in the Solera, so this is a rum of phenomenal complexity and age. Drinkers can expect flavours of chocolate, citrus zest, cedar wood, dark oak, pineapple, mango, bananas, oranges, figs, dried fruit and toasted spice. 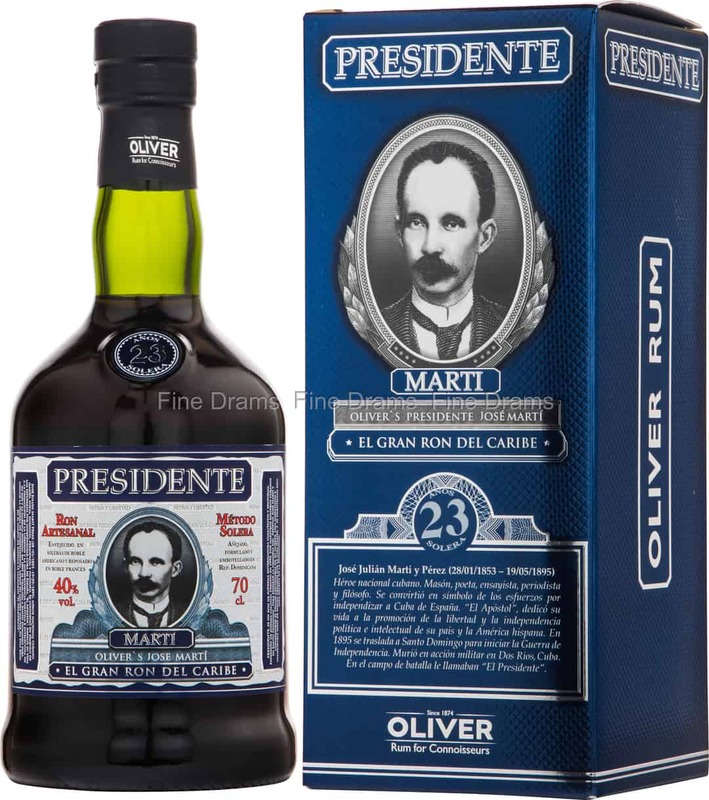 A complex, yet delicate rum with an excellent balance of flavours, Presidente Marti 23 Year Old is another fine bottling from Oliver and Oliver.